We know just how expensive Christmas and New Year can be so if you fancy an evening out at your favourite club for FREE then come along and join the party. This event caters for couples, single gentlemen and single ladies so we know tonight will be a real fun night with lots of naughty people doing lots of naughty things. Also we have invited our resident DJ to play the latest music to create a real fun party atmosphere that Libs is renowned for. 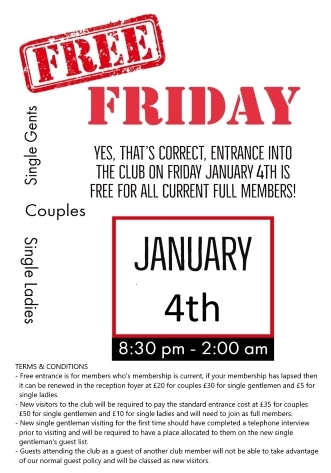 – Free entrance is for members who’s membership is current, if your membership has lapsed then it can be renewed in the reception foyer at £20 for couples £30 for single gentlemen and £5 for single ladies. – New visitors to the club will be required to pay the standard entrance cost at £35 for couples £50 for single gentlemen and £10 for single ladies and will need to join as full members. – New single gentleman visiting for the first time should have completed a telephone interview prior to visiting and will be required to have a place allocated to them on the new single gentleman’s guest list. – Guests attending the club as a guest of another club member will not be able to take advantage of our normal guest policy and will be classed as new visitors.